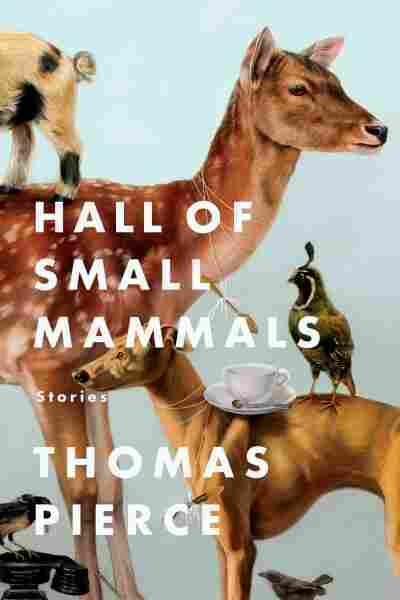 Confident Tales Of 'Small Mammals,' Funny Videos And Childhood Ghosts Thomas Pierce's debut story collection, Hall of Small Mammals, focuses on finding the surreal within the mundane. Reviewer Michael Schaub calls Pierce "an endlessly incisive and engaging writer." The first small mammal in Thomas Pierce's short story collection is Shirley Temple Three, "waist-high, with a pelt of dirty-blond fur that hangs in tangled draggles to the dirt." Shirley is a dwarf mammoth, a member of a species that hasn't been around for millennia, cloned for the sake of a television show called Back from Extinction. The show's host, Tommy, is hiding the tiny elephant at his mother's house to save it from euthanasia. His mother is grateful to have any contact at all with her distant son, but she has misgivings about her new housemate's origins: "It's been yanked out of its own time and lives outside God's natural laws. ... What if today is still God's seventh day and He still hasn't woken up yet from His rest? That would explain why He's been so quiet lately. What if, when He wakes up on the eighth morning, He decides He doesn't like what we've been up to down here?" "Shirley Temple Three" is one of the most touching and original stories in Hall of Small Mammals, a debut collection that reads like the work of a much older, established fiction master. The stories in Pierce's book explore the ordinary in the otherworldly, the surreal in the mundane, and the results are stunning and unexpected. Some of Pierce's stories have a bizarre, compelling mix of pathos and humor that recalls writers like George Saunders. In "Videos of People Falling Down," he explores the unexpected connections among people whose accidents were videotaped and posted on social media (complete with titles like "People Falling on Snow/Ice Funny!!!" and "Fatty Kids Falling Watch N Laff"). An awkward boy wipes out on a Slip'N Slide toy, and his fall is videotaped; it later ends up in a viral compilation of "funny accidents," posted online years later by the now grown boy himself. His friend narrowly escapes death in a falling elevator on the way to visit him; that also ends up looped on a video sharing site. One character sees footage of her fall as part of an art exhibit, and isn't sure how to feel: "She watches the video loop through three more times before going home to her husband and doing her best to forget that things still exist even when you're not looking at them." It's a fascinating look at both the human beings behind viral YouTube content, and the surprising connections that bind us all both online and off. While Pierce has a real affection for the fantastic and the dreamlike, he shines even more brightly when writing about the prosaic. In "Felix Not Arriving," he follows a voice actor and comedian visiting his son and the boy's mother, who's about to get married. It's hard not to like Felix just a little bit, even though he's self-centered and petty, unable to restrain himself from being a jerk in pretty much every situation. But Pierce writes the character so realistically, so unsparingly, that the reader almost understands what might make him tick — Felix is arguably a manchild, but he's inarguably imperfect, real, human. The best story in the collection is "Grasshopper Kings," about a father and son attempting to bond at a camp sponsored by a Boy Scouts-like group. It doesn't take long for the father to realize that he can't teach his son how to belong, when he's incapable of doing it himself: "Inside every group, he decides, there are more groups. Circles within circles, and inside of those, more circles still, all of them infinitely divisible. ... One day he'll have to explain to his son how most games are rigged, and how sometimes it's best not to play at all." There isn't a weak story in Hall of Small Mammals, and Pierce is an endlessly incisive and engaging writer. It's a book full of wisdom and emotion, with stories that explore what it means to live and die in a world filled with invisible things: "You can only pretend the ghost is not there, hope it loses interest, evaporates, moves on, does whatever it is that ghosts do when they disappear completely." But ghosts, it turns out, are like extinct mammals, like videotaped falls, like childhood resentments — they might go invisible for years, but they never truly disappear, not really.